Blepharitis is the medical term for inflammation of the eyelids. It is a very common condition, which although it can affect all ages is more common in the elderly. 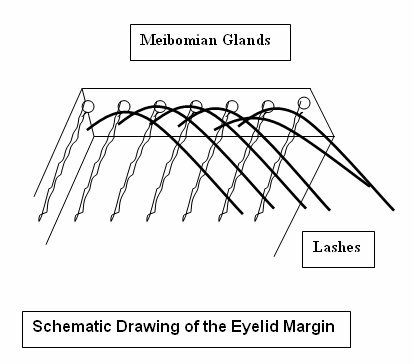 The eyelid margins as well as having eyelashes protruding from their front (anterior) surface, have the openings of oil glands (meibomian glands) behind the lashes (posterior surface). The meibomian glands secrete oil into the tear film to lubricate the lid and reduce tear evaporation. This affects the front of the eyelids around the eyelashes and may be due to seborrhoeic dermatitis (similar to dandruff) which may also involve the scalp, face and ears or due to staphylococcal bacterial infection. Burning and grittiness of the eyes. Thickening, crusting, swelling and redness of eyelids. Loss of and in-growing of eyelashes. Styes and small ulcers on the eyelid margins. Secondary dry eye symptoms due to lack of Meibomian (oil) secretions. Using a slit-lamp (an instrument used by eye doctors to obtain a magnified image of a patient's eye), the eyelids appear red and inflamed with crusts and scales around the lash bases. There may be blocked meibomian (oil) gland openings with rounding of the posterior lid margin and cloudy and thickened oil on expression. The lid may have associated notches, styes and meibomian gland cysts. Reduced tear film instability is often present, seen by staining the tear film with a yellow dye called fluorescein. Inflammation and loss of the corneal surface skin cells (the epithelium) may be seen on fluorescein staining. Removing the crusts and scales from the eyelid margins and unblocking the glands in the eyelids by lid cleaning and warm compresses. Treating dry eye symptoms and tear film instability, if present, with artificial tear drops. Treating acute infection if present with antibiotic ointment such as Fucithalmic (fusidic acid), which is useful against Staphylococci. Treating any associated corneal and conjunctival inflammation with weak mild steroid eye drops such as FML (short courses only and only under Ophthalmological supervision). Systemic tetracyclines such as doxycycline, lymecycline which are useful in posterior blepharitis and cases associated with rosacea. May need to be continued for several months even years at low doses. Other antibiotics such as azithromycin, which can be used both topically on the eye or taken by mouth. Anti-yeast shampoos may be useful in cases associated with Seborrhoeic dermatitis. The demodex mite (folliculorum and brevis) have been implicated in some cases of blepharitis and commercial eyelid cleaning preparations containing tea tree oil or Metronidazole gel applied to the eyelids may be effective in such cases. There is increasing research to suggest beneficial effects of omega-3 fatty acids supplements in reducing eyelid inflammation and addressing some of the associated dry eye problems. Lid cleaning is essential for the control of blepharitis and initially may need to be performed frequently (twice a day) for several months and even when symptoms have resolved should continue indefinitely at least 3-5 times a week to prevent recurrence (for ladies it can be incorporated into their make-up removing regimen). Application to the closed eyelids of a warm compress for 7-10 minutes will help soften hardened oil secretions associated with Meibomian gland dysfunction as well as crusts and scales around the eyelashes. This can be facilitated with a clean flannel/washcloth soaked in warm/hot water, although commercially available "eye bags" that can be heated in a microwave are better as they provide more consistent heat application for longer time periods. It is important to check the temperature of the compress is not too hot prior to application onto the eyelids. Very Gentle massage of the eyelids will help open and unblock the meibomian glands. This is achieved by pinching the eyelid between a clean thumb and forefinger without applying any direct pressure to the eye itself (this is achieved by gently lifting the eyelid slightly away from the eye itself. Each lid is massaged/pinched about 5 times starting at the inner aspect (near the nose) moving along to the outer aspect (near the cheek). The eyelids can be cleaned either using a Q-tip cotton bud soaked in cooled boiled water or with commercially available eye pads and solutions. Gently rub the Q-tip or pad along the lower lid margin while tilting the lid outward with a finger of the other hand. The upper lid is more difficult to clean and is probably best done with the eyelid closed pulling it slightly over the lower lid to prevent the Q-tip or pad being poked into the eye. Antibiotic ointments and drops can then be applied following this cleaning regimen. This is involves anaesthetising the eyelid margin with an anaesthetic gel and then opening and probing the meibomian (oil) glands along the lid margins. It has been shown to be effective in many cases refractory to conventional treatments, with improved ocular comfort and reduced symptoms of dryness. Professor O'Brart is one of only a very few Ophthalmic Surgeons offering this treatment in the UK. He has been performing the technique for the past 7 years and has found the results encouraging in many patients unresponsive to conventional therapies. For those patients with excessive crusts and scales around the eyelash bases, Professor O'Brart often advises an eyelid cleaning with the new BlephEx™ device. This is an innovative hand-held instrument which is used to, very precisely and carefully, spin a medical grade micro-sponge along the edge of the eyelids and lashes, removing scurf and debris and gently exfoliating the eyelid skin. In those with extensive eyelid scaling, Professor O'Brart has found this device to sometimes result in a rapid improvement in symptoms. The MiBoFlo Thermoflo® is a new therapeutic device for the treatment of dry eye, which employs a proprietary thermoelectric heat pump to apply continuous heat directly to the eye-lids. The application such controlled heating is designed to liquefy thick oil secretions within the blocked meibomian glands and improve glandular function and oil flow from the glands. Professor O'Brart combines this treatment with a meibomian gland expression treatment and has found this procedure to be useful in those mainly posterior blepharitis where the glands are producing buttery and/or thick tooth-paste rather than clear oil secretions. Intense pulsed light (or IPL) was originally developed for use in dermatology for the treatment of rosacea and other conditions. Brief, powerful bursts of light, at wavelengths between 500 and 800 nm, are applied to the skin above and below, but not directly on, the eyelid skin. These light pulses cause changes in blood vessels near the surface of the skin. They are thought to constrict superficial blood vessels, reducing eyelid inflammation. It is still a relatively new technique but encouraging results have been reported in the scientific literature in patients with posterior blepharitis, with reported improvements in dry eye symptoms, meibomian gland function and eye-lid appearance.